We are meeting the candidates you need every single day. We are not waiting on your specific opportunity. We are results-oriented, working tirelessly to avoid wasting your time. Ask us how! When does the typical staffing firm start looking for the candidates you need? Most likely, the answer is right after you send over the job description. They are neither proactive nor are they forging long-term relationships. This is not Sysazzle. Using a time-tested process, we learn and understand your needs. 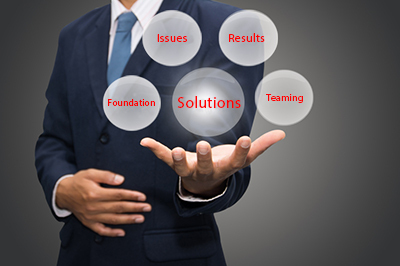 We counsel you on the many approaches that can be taken to solve the problem and then together we determine the solution that fits you best. We focus on delivering the results you need. Sysazzle teams with clients in order to get results. We are expert questioners finding where our clients and candidates are frustrated and why they need our help. Sysazzle – Powered by the F.I.R.S.T. Method®. We Care. We Ask and Listen. We Share your challenges and urgency. We provide on-target Solutions. We seek to be a Resource , not just another vendor. F – Foundation – Develop rapport and build trust by getting to know you. I – Issues – Uncover needs and discuss current and future challenges. R – Results – Identify the results sought. S – Solutions – Discover and discuss possible solutions. T – Teaming – Identify who else is involved in the solution and how to get started. Sysazzle forges (yes, forges like iron) relationships with our clients and candidates. We look at each relationship as more than just a business transaction. Sysazzle works with you to understand your long-term wants and needs.